Taken at Lyme Regis. It works better on large view if you have a moment. This is beautiful Alison. Those clouds are perfect. loving the red sails and the red shirt against the backdrop of the sky and clouds. Very cool capture Alison! I just love this, Alison! Wonderful composition. I especially like the unity between the red said and man's red shirt. I also like those dramatic clouds and how small the man looks in the scene. FAV! I don't know what I like best about this composition - it has so much going for it. That sky is gorgeous - really dramatic with those clouds. And the twin pops of red were like you planned them - perfect. Love the large/small dark/light comparisons in the photo. It's just really neat. That is really good when viewed large. A stunning seascape. A Fav. An amazing seaside shot for October, worth viewing large. Awesome capture and view. Love the red sails. Instant fav. 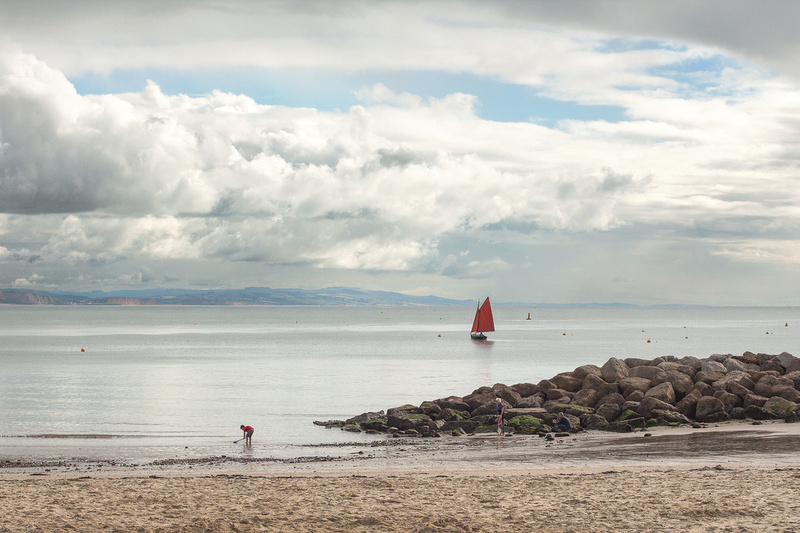 Gorgeous calm scene and love the pops of red from the sail and young boy's shirt. Picture perfect composition, Alison! Beautiful capture. I like the two pops of red. Great composition. There is a beautifully balanced Z-formation in the picture - and those clouds are so painterly! Wonderful composition. Love the inclusion of the child with the shrimp net. Perfect. This just needs a frame, and it could be hanging on the wall of a gallery. A beautiful beach scene,love the lone figure at the water's edge!! FAV!! Fav. Beautiful. The Red sail is a sight. The composition of the boy, sail and even thro to the buoy is great, your eye keeps moving on. The wall points down to the boy too. Lovely clouds. the whole shot is wonderfully composed. @hamble Thank you, Hamble. Because of the way I now save my shots after I process them, the time and date you see refer to when the shot was saved. Maybe I should state that more often in the caption. That should read 'the boy'..... Stupid predictive text! !